A mouth guard can protect your oral health, as well as your overall health. It is definitely a versatile appliance to discuss with your dentist. There are different types of mouth guards and each has a purpose. The first is a mouth guard used for sports and other activities. Athletes are highly recommended, if not required, to wear one. This small, comfortable device is worn inside the mouth. It provides protection for the teeth and gums if the impact to the mouth occurs. Examples include the impact from another player, sports equipment, or falling while playing a sport. 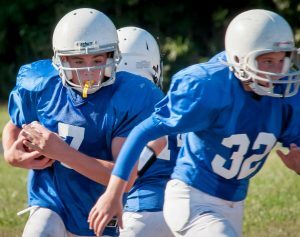 The mouth guard can prevent a wide range of injuries. The wearer will not break or chip his teeth, bite his tongue, or have his teeth loosened from his gums. It even offers protection for the gums and jaw. The second type of mouth guard is meant to be worn during the night. Individuals who grind their teeth while sleeping has a higher risk of oral health problems. Grinding can loosen teeth, wear down tooth enamel, and may contribute to TMJ disorders. The mouth guard is an effective way to prevent nighttime grinding. The simplest way to obtain a mouth guard is to consult with your dentist. As not all mouth guards are alike, he or she can help you choose one that is right for you. When you start by talking to your dentist, you will have the most comfortable, effective experience. Whether you need a mouth guard for sports or to prevent nighttime grinding, you will have better results than if you simply buy a mouth guard online or from a sporting goods store. To take an important step in protecting your oral health, schedule an appointment with Dr. Dana Walters today. Treatments Offered For Teeth GrindingWhen Is A Root Canal Necessary?